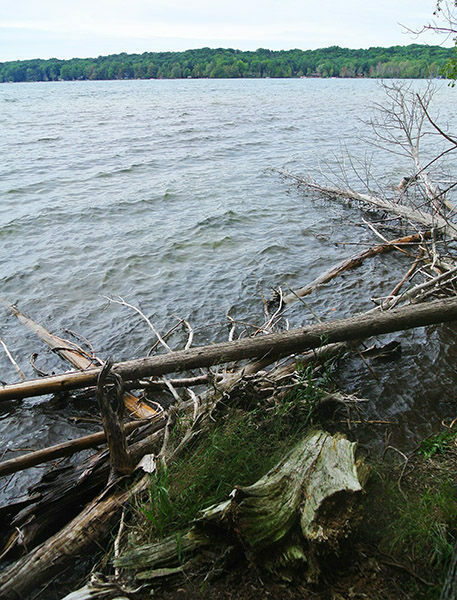 Swanson Preserve covers 83 acres and includes more than 2,000 feet of natural wooded shoreline near the east end of Little Traverse Lake, the fragile wetlands that are critical to the lake’s high water quality and a 162-foot high ridge on the south side of M-22. Most of the preserve is heavily wooded and open to the public. Access is primarily from a short trail system that leads through woods and wetlands to the shores of the 640-acre lake. 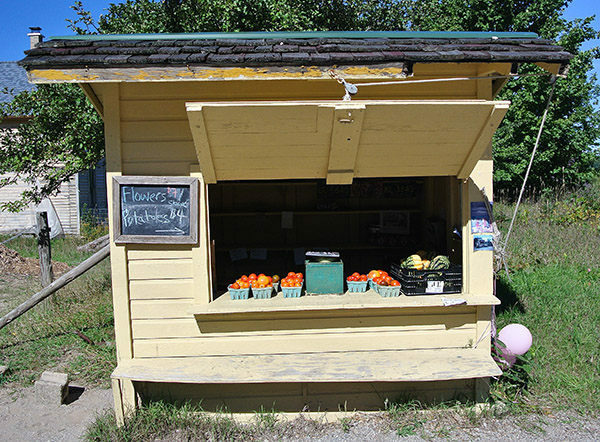 Farm stands are a common sight along M-22 but none have been such an enduring sign of fresh produce as the pale yellow roadside stand near Little Traverse Lake. For more than a half century, Sonny Swanson stocked that hut with strawberries, sweet corn, tomatoes, pumpkins and whatever else he nurtured from the rich soil of his adjacent farm and in the process became one of the most beloved farmers on the Leelanau Peninsula. Swanson died in 2008 at age 89 and a year later the Leelanau Conservancy was already committed to preserving the farm and one of the largest stretches of undeveloped shorelines remaining along Little Traverse Lake. The fundraising effort resulted in the conservancy purchasing 96 acres from Swanson’s sons in 2010. Within that tract, Swanson Preserve covers 83 acres and includes more than 2,000 feet of natural wooded shoreline near the east end of Little Traverse Lake, the fragile wetlands that are critical to the lake’s high water quality and a 162-foot high ridge on the south side of M-22. Most of the preserve is heavily wooded and open to the public. Access is primarily from a short trail system that leads through woods and wetlands to the shores of the 640-acre lake. The gravel parking area for Swanson Preserve is on the edge of an open field, where a foot path enters the woods and immediately arrives at the potting site for Wildflower Rescue. An arm of the Leelanau Conservancy, Wildflower Rescue was started in 1999 with the intent to save native plants from the construction of roads, buildings, homes and other development. Plants are removed, potted and then donated to public gardens or sold to raise funds for the conservancy. Just beyond the potting site the trail crosses an old two-track and a quarter mile from the trailhead arrives at a boardwalk. The planking keeps the boots dry as you cross a stream and pass through a wetland area of seeps and springs, all feeding into Little Traverse Lake. Just beyond the boardwalk is a posted junction to a pair of short spurs to the lake. 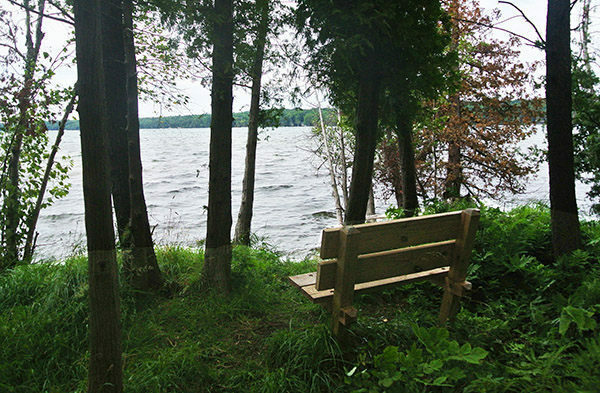 Head left and you’ll briefly skirt an unnamed stream and arrive at a bench overlooking Little Traverse Lake at Mile 0.3. It’s less than 200 yards to the end of the other spur, a beautiful spot on the lake where a grove of titled white cedars grace the shoreline. Backtrack to the junction and then across the boardwalk to reach the trailhead at Mile 0.72. There are no facilities at the trailhead of Swanson Preserve. Swanson Preserve is open year-round. There are no fees for enjoying the trails. 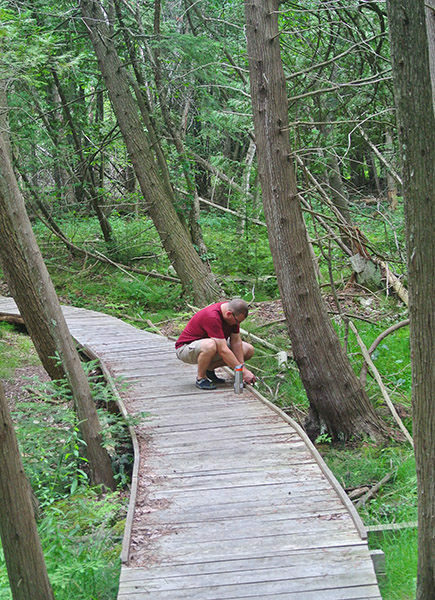 Swanson Preserve is along M-22, 8 miles south of Leland or 11 miles northeast of Glen Arbor. The trailhead with parking is a posted gravel driveway about 300 yards south of the Sonny Swanson’s yellow farm stand.